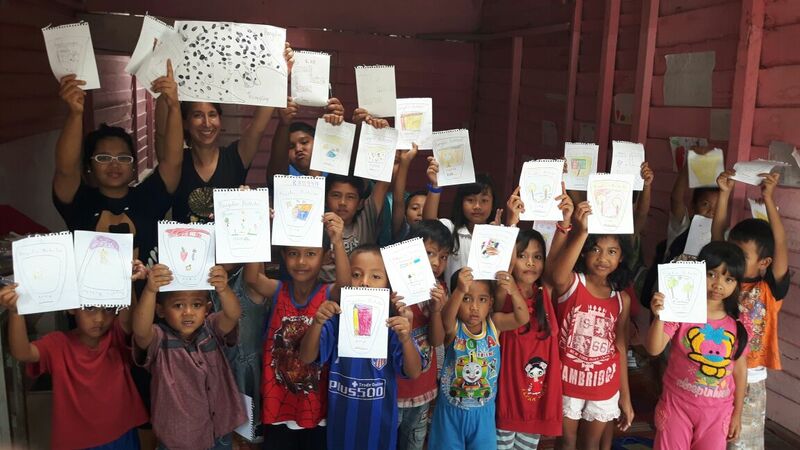 Students in Borneo displaying their pangolin scale drawings during an educational outreach program conducted by Louise Fletcher. Image provide by Louise Fletcher. Olivia and Carter have been involved with numerous animal conservation efforts since starting OMG back in 2009. Each time they learned about another species needing help, they sat down and created some sort of global awareness campaign designed to educate and inspire others to get involved with protecting the species. We are still working hard collecting letters for their Orangutan Letter Writing Campaign. Olivia and Carter are hoping to attend the UN/GRASP Conference in Jakarta in Nov where they will hand over all the thousands of letters they have collected so far to the Indonesian government. As always, the kids are always looking for what they can do next and together they have decided that the next species they will focus their attention towards is the pangolin. In case you don’t know what a Pangolin is, let us start to explain by telling you that the pangolin is the most trafficked mammal on the planet and most people don’t even know what they look like. We will be featuring a global outreach program for pangolins in early 2017, but in the meantime, Olivia and Carter are busy reaching out to some of the world’s experts on the species and aligning themselves with organizations and individuals who are already working hard to save pangolins. One of those special people that Olivia and Carter have been working with in Louise Fletcher. Louise lives in the UK but travels frequently to Asia where she works tirelessly on finding ways to save pangolins. Louise is a member of the IUCN SSC Pangolin Specialist Group and has been involved with pangolin conservation for many years. Olivia and Carter first learned about Louise and her work after being introduced to the acclaimed “A Pangolin Tale” children’s book which Louise illustrated entirely on her own. After ordering a copy, Olivia and Carter loved it so much that they ordered more copies and has since presented them to several distinguished individuals they work with at the US State Department and even at the Wilson Center in Washington DC. After months of Skype calls, Olivia and Carter decided to invite Louise to be one of our OMG Advisory Board Members and she graciously agreed. Since then, we have been working with Louise and continuing our outreach around the world as we prepare for the launch of our pangolin campaign. 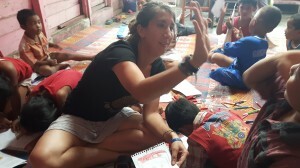 Louise is currently in Indonesia working with locals in several villages and even meeting with pangolin poachers in an effort o find ways she can engage the villages so that conserving the species will be more lucrative for them that poaching them. program that Olivia and Carter worked with while in South Africa on the rhino campaign. The Sniffer Dog program teaches dogs to find traces of rhino horn so that it is easies to catch people trying to smuggle rhino horn out of the country. Louise is now discussing the possibility have having dogs trained to find pangolins so that more detailed studies of their habitat can be completed which would aid in the conservation of their habitat. While in Sumatra, Louise managed to meet up with several schools and provide her outreach program to students. 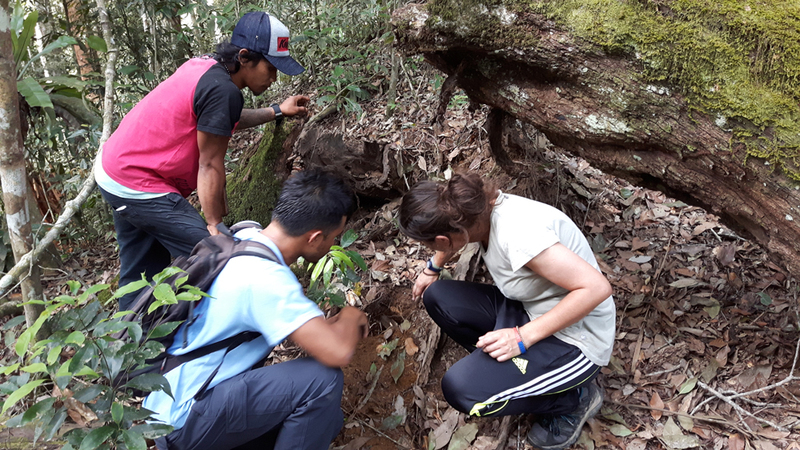 As you can see, the students loved learning about the species and more importantly, they love being tasked with the conservation of the species. The image at the top of this article shows the drawings students made to declare that they are all now official Pangolin Protectors. Louise can be seen holding up a drawing she made of a pangolin and then all the students placed their thumbs in ink and added it to the drawing to represent the pangolins scales and at the same time, make their own statement that they too care for the species.